Every two months or so I will be putting a Newsletter onto our website to update all our friends and guests around the globe. Sorry for the delay in writing this newsletter for you, but it’s been another very busy period here on the fishery and my feet have barely touched the ground! My pub is taking a lot of organising and with a fishery, seven holiday cottages and three young children to look after, it’s full on at times! I must be mad! Read on and you will find out what I have been up to! The Trout n Tipple is moving ahead! Eight new huge plant pots now sit along the front of the pub all full with daffodil bulbs for opening day! It’s so exciting! Three new wood burners in main bar and lounge. New slate floor on ground floor with underfloor heating in the bar. The photos below give you an insight in to the condition of the pub at the moment! Don’t worry, I will have it all straight by the 5th April at noon! I now have planning but I still have no builder to do the work but it will be ready! A few people think I won’t be able to complete it in time and a few think I’m stupid for doing it up in the first place. There are lots of nice people who are supporting me and I would like to say a big thank you to those people who truly do make my life on the fishery so rewarding!! My late father made me strong and it is really not a problem at all for me to have a huge task ahead. I will put my head down and plough on through what seems like endless meetings with different tradesmen and authorities. Tagged fish in all our lakes give prizes to Tavistock angler’s and will start the day after Boxing Day! Yes, I really mean it! What would you like to win from your tagged fish? Email in your suggestions! I now have 10 different coloured numbered tags to go on my trout! They are numbered from 001 to 300! 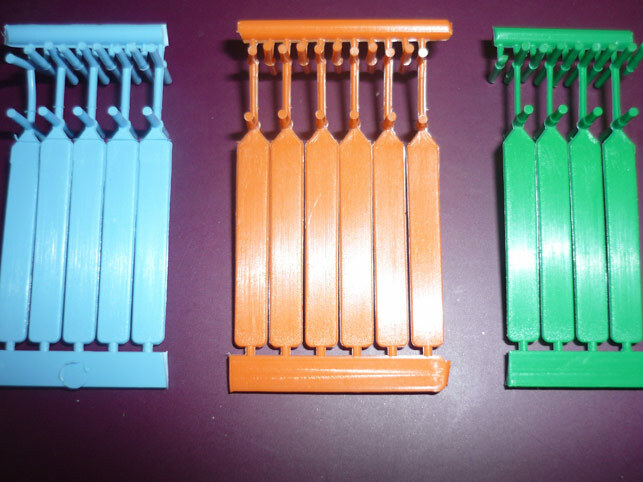 Each colour will mean a different sort of prize! From tackle to fly fishing permits and from meals in the pub to holidays on the fishery! Wow, come on and win yourself a prize! Photos of all the winners with their tagged fish will be posted in our Newsletters and on our Facebook page! 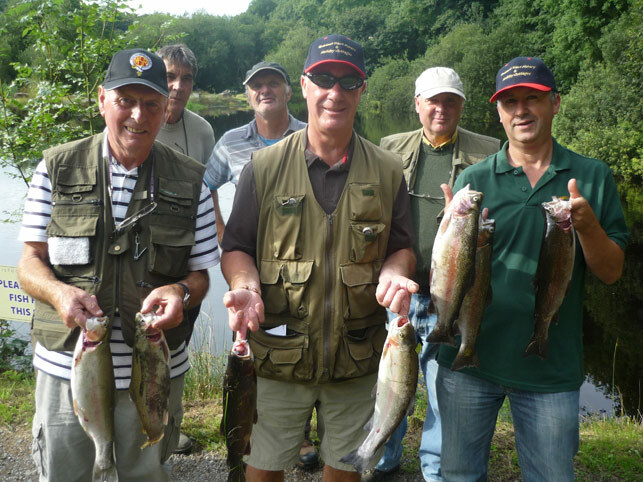 Tavistock Trout Fishery is all about providing an angler with an amazing day out or a fantastic weeks holiday! Either way with prizes up for grabs, a stunning pub only yards away, beautiful cottages/apartments and great fishing on your doorstep, next year it will be a real fly anglers paradise! New Fly Fishing Permits are now on offer! I have now introduced some new permits and wow aren’t they going down well with my anglers! These permits allow the angler to choose one fish from our Osprey Lakes and one, two, three, for or five fish from our Kingfisher and Heron Lakes. It is really lovely to see so many anglers enjoying my fishery in these colder months! Ideal Christmas Presents at Tavistock Trout Fishery! If you would like to buy a fishing permit for a Christmas present, just give us a call! You can pay by card over the phone and we will send it to you! You can even purchase a weekend holiday voucher and the recipient can choose the date after Christmas! We have fly fishing tackle bags and rod and reel sets on offer throughout December, so give us a call to arrange a gift for your loved one! Ring Abigail on 01822 615441. Photo of Mrs Clark (winner of our holiday competition). John and Lesely had an amazing holiday on the fishery!! First and foremost a very special thank you to you and your team at the fishery for our wonderful prize and the great time we had last week. The fishing was tremendous and the grounds and animals around the lakes were truly beautiful. I haven’t had so much fun feeding the chickens, pigs, donkeys, guinea fowl and those very courageous turkeys since I was a kid. Lesley caught her first ever trout fly fishing and on the first day we took four fish out two to myself, and two to Lesley, unfortunately for me Lesley also bagged the biggest fish of the day, which she insisted in mentioning to everyone we spoke to that evening, as well as sending pictures to all our fishing friends and family, so I had to eat humble pie for a little while. The accommodation was lovely and we had such good weather that sitting out having breakfast in the mornings overlooking the lakes was a real bonus. We are now looking forward to coming back to the fishery hopefully in April next year for some more excellent fishing and to toast the opening of the pub. I have attached a picture of Lesley’s first trout fishing success and the infamous largest fish of the day for your photo gallery, I declined to get my photo took on the day as I couldn’t quite manage as big a smile as Lesley Again thank you for the lovely time at the fishery and see you next year. Surprise Trip for my family! 2nd August – Delightful friends Steve and Tina Hood and their children arrived and I welcomed them all with a glass of Champagne! 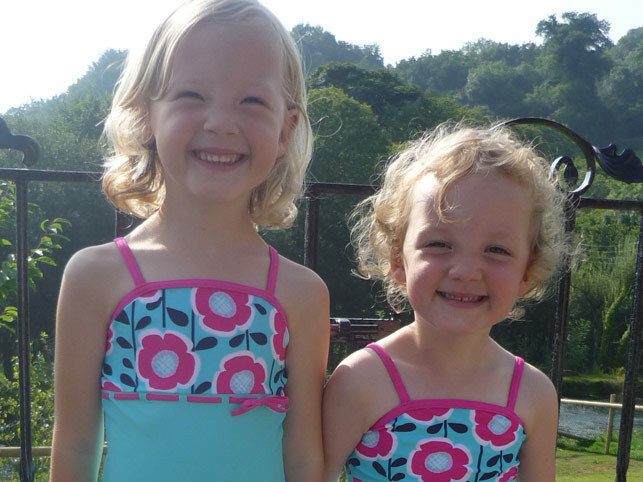 Steve and Tina are both very keen fly fishing people and so are their two delightful children! I can truly say that Tina spoilt us with goodies all week, fortunately Tina loves chocolate just as much as I do! 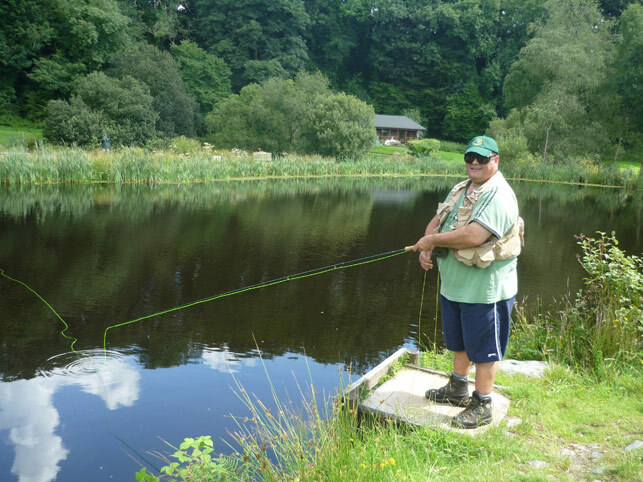 Below is a lovely photo of Steve fishing on one of our Osprey Lakes. 7th August – I visited the WDBC offices to ask the planning inspector if he liked my proposals for The Trout n Tipple and fortunately he said yes! I was so happy! In truth pubs are of course having a hard time but my accountant and I feel that it a good investment to bring the pub up to date with lovely modern bathrooms etc. I will however be keeping nearly all of its traditional features. 8th August – An angler of mine Mr Adrian Kruger from LWC met me at the pub to have a look around. Adrian is keen to supply our beers etc and I have agreed in principal to this. 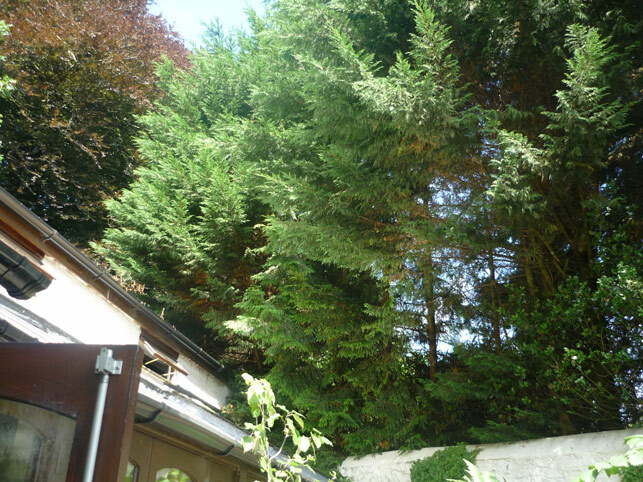 – My neighbour next to the pub isn’t keen to cut down her very tall trees that overhang my property and unfortunately she resorted to using bad language..
– Two people carried out a bat survey in The Trout n Tipple roof and didn’t find any bats! Yippee! But they did find machine gun ammunition case and a gun cleaning kit! I phoned the police help line and they said take it to my local police station. I drove to the police station in Tavistock but unfortunately it was shut! I didn’t think that I should post it through the letter box and so I put it back in the car! I telephoned the police again but she kept me on the phone so long that I ended up driving to Launceston to hand it in! All well that ends well, no bats and now no machine gun magazines! 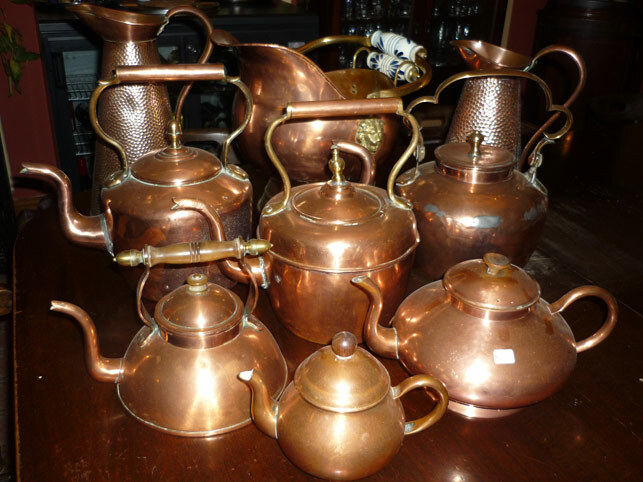 11th August – Always great to go to a car boot for a walk around but to actually find some copper bits to put into The Trout n Tipple made my day! Now I have a little collection! If you see any around that aren’t expensive and would like to pick them up for me, I will happily pay you for them! My father liked copper in the pub and so I want to decorate it with a few pieces..
17th August – 16 years ago today my father died. I try not to look upon it as a sad day, just a day that he is in my thoughts and a day whereby I remember the good times. 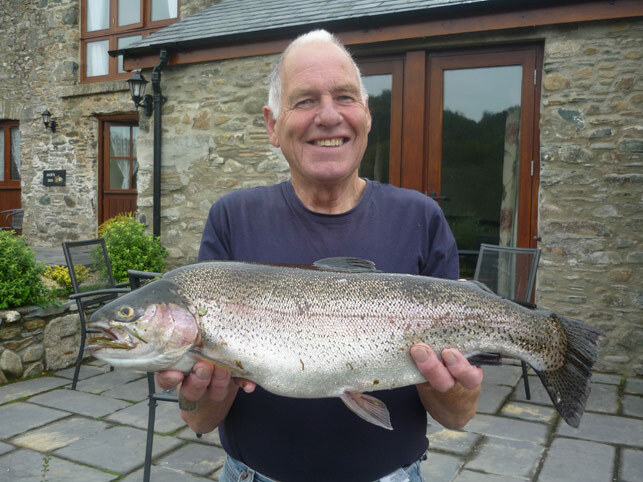 – Tony Steel had a lovely visit on this day with his friends when he caught a fine trout of 7lbs. 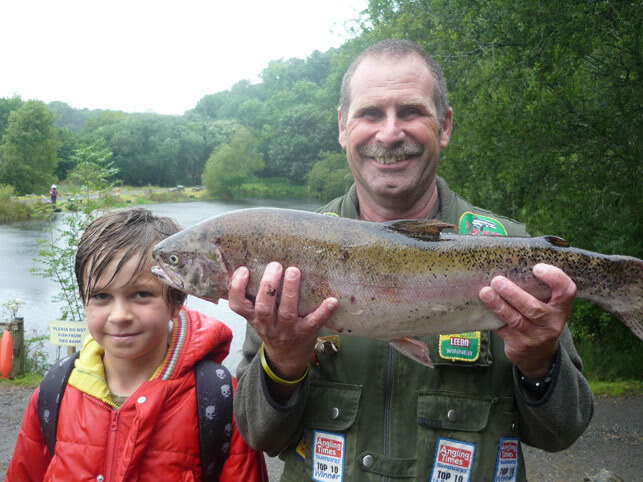 18th August – Wistlandpound Fly Fishing Club visited the fishery for a great day’s sport! Well done chaps! 24th August – Russ Symons is a friend who I have known for over 20 years and to have him visit my fishery is always a pure delight! I managed to tempt Russ into having a cool beer from my fridge and it was a lovely day! 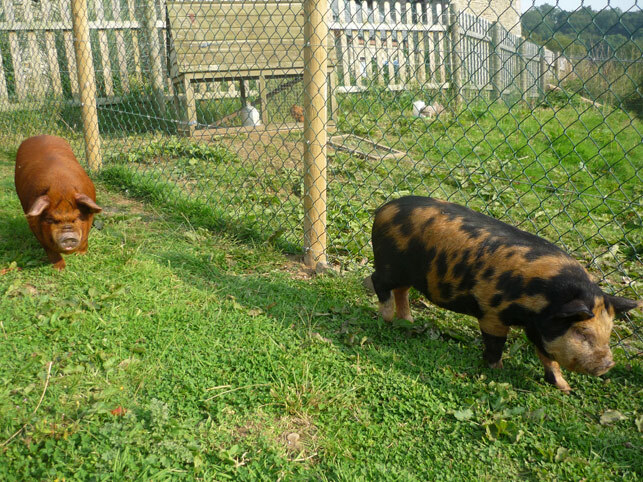 25th August – Uncle Neville and Auntie Mary delivered our two new pigs, Rasher and Chop! What little sweeties they are! Rasher is the brown girl and Chop is the spotty boy. You are welcome to stroke them when you visit the fishery. 31st August – A lovely surprise was to find the menus at The Trout n Tipple that I had made 16 years ago. I wiped them all off and dried them and now they are stored away just in case I would like to use them next April. I have lots of ideas for the food in the pub but I must admit, that I think it will be good pub food and not too posh. Most of the people that I have spoken to just want nice meals and a good portion. 9th September – If a family member gave you a gift would you say thanks? Of course you would! 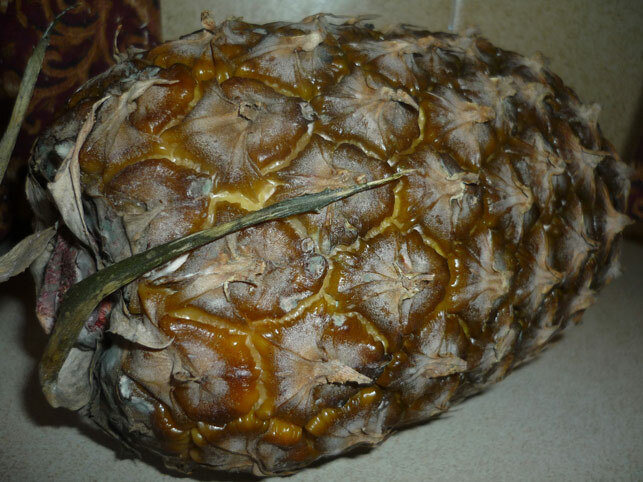 But if a close family member gave you no other gifts just one rotten pineapple would you say thanks? Yes, I did say thanks but my ginger Kunekune pig Geri loved it! 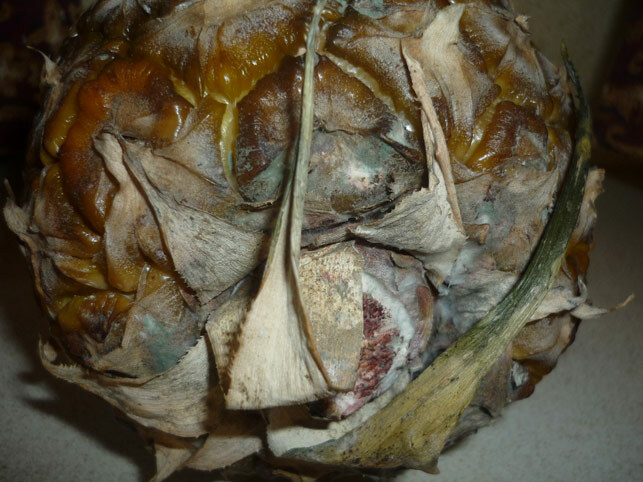 Maybe giving someone a rotten piece of fruit means you want to give them bad luck, not sure but my little family and I are fine thanks, so we don’t need anymore rotten fruit! 14th September – Jack’s Rugby Team from Kelly College played at Shebbear and Jack played every so well and was awarded man of the match! 20th September – After 7 nights at the fishing, Robert Fisher ended his holiday in a perfect way by managing to catch a fine Triploid Rainbow of 8lbs on his final morning! Well done Robert! 25th September – Today was a fun day when my eight lovely huge concrete troughs were delivered to The Trout n Tipple! I was so excited! I immediately set off to collect my compost and daffodil bulbs to plant so that I have an amazing show for opening day. 3rd October – I had a meeting with a planning man from West Devon Borough Council at The Trout n Tipple about the application I had submitted. I showed him around and he asked questions and I explained my reasons for the alterations. He said that he would let me know by the 31st October. Before he left he told me that my enthusiasm was infectious! I of course was chuffed to bits! 12th October – Another active day with Reece, Pete and Fatboy and I emptied out some more rubbish from my pub again. It seems never ending but I am still full of energy for it and I am enjoying it all! 16th October – I went shopping in Morrisons and noticed some Champagne on offer inside the door. Just what I needed I thought for opening day in my pub! I immediately picked one up and thought I’ll take this one home and try it tonight and if it’s any good, I’ll pop back tomorrow and buy some more! 17th October – Much to my relief the Champagne was first class and so I popped back to Morrisons and bought another 22 bottles! Yummy! Roll on opening day! 21st October – I had a meeting at The Trout n Tipple with a SWW man about my existing water pipe being too small. Much to my surprise he told me that my water meter was spinning around and that I must have leaks in my pipe! Not what I wanted to hear at all! While having a good look around the pub in the rain, a lorry passed and drove straight through a large puddle! I thought it was hilarious as I got a little wet but the man from SWW on the other hand didn’t think that it was very funny as he got soaked! 24th October – I met an EHO at the pub to discuss any issues that she might have and I raised a few ideas that I had and she was superb! I have arranged with her to make a final inspection before I open my pub on the 26th March! 28th October – I received a phone call in the afternoon from my architect telling me that he had just heard that my planning for The Trout n Tipple had been granted! Yippee! To say that I was excited was an understatement! I was bursting like a balloon and I could hardly contain myself! I offered my girls a glass of lemonade and I thought, well it seems only right that I should celebrate with a bottle of Champagne, even though it was only a Monday! So as I heard Mark arrive home, I opened a bottle of my favourite, Moet Chandon! A very special bottle of Champagne this was too as John and Lesely Clark from Poole gave it to me as a gift for giving them a lovely free holiday! Well back to it, Mark and I drank the bottle and as it tasted amazing, we decided to open another! Not good on a Monday, as on the Tuesday I woke up feeling rubbish! Never again…. 30th October – As I know that April will soon be around and I must keep up the momentum with my number one renovation project at the moment, the pub and so I arranged 4 meetings at the pub for this morning. First with Adrian Kruger, second a carpet salesman, third an upholster and fourth an alarm specialist. It went amazingly well and I am getting more excited by the minute! 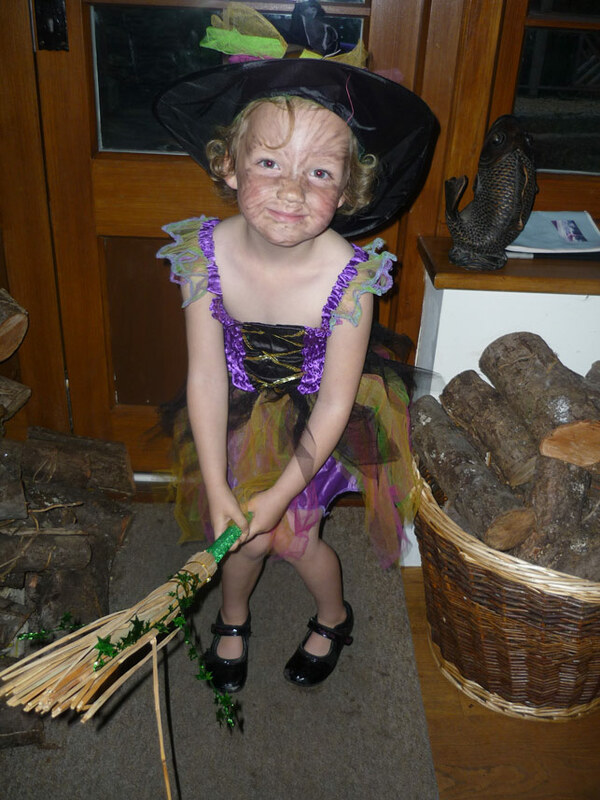 31st October – My girls dressed up in their Halloween outfits and had a ball! Next year they will be having a party in The Trout n Tipple! Below Amelia learns to fly! These next few months are always very nice for those anglers who are not put off by the cooler weather as on week days there is normally more room on the fishery to fish! I tend to favour orange flies in the winter and I can definitely say that they normally produce more fish! Free tea and coffee and yummy biscuits for all anglers fishing and even hot chocolate too for these winter months! We will be open throughout the Christmas and New Year period except for Christmas Day and Boxing Day. We will be open New Year’s Day and the Monday after Christmas. Yummy complimentary cake, biscuits and tea/coffee will be available in the angler’s tea room. I look forward to welcoming you all! A little support will go along way! 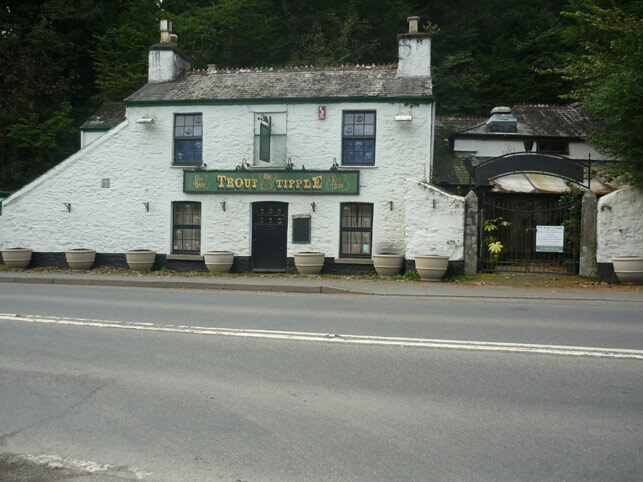 The Trout n Tipple will undoubtedly be a huge task for me and for my business to undertake but I am a determined woman and I will not give up on this gorgeous country pub that my late father purchased for me before he died. As I invest thousands of pounds into my pub at a time when a lot of pubs are struggling or even closed, I urge you all to visit it when it re-opens and to support me and my true Devon pub. It will be serving a variety of lovely meals and four cask ales will be of offer! I of course will be there a lot of the time to begin with making sure it is all running smoothly and serving behind the bar when needed. Even after it is up and running I will still continue to oversee it and work there on many shifts during a week! Mark and my children are looking forward to it too!